The kid goes to a French immersion school here in Columbus, Ecole Kenwood. The Europeans and Francophiles on staff were an irresistible gang to try a small bread baking production effort. Baking on a large scale has been tricky for me in the past, so I decided to use a retarded (cognitively disabled, sorry) rising to slow things down and gain control over the baking stage. I can't give all the details, but the pics show the sequence adequately and I wanted to use this entry to remind myself of things I did that I would and would not change. This past Friday night, I mixed 4 batches of dough. Each batch was 400 g cold water, 1 packet rapid rise yeast, 10 g salt and 600 grams Montana Sapphire unbleached white. I plopped the 4 kg in a large stockpot for the weekend. Temperatures outside were 18-39°F throughout the weekend. 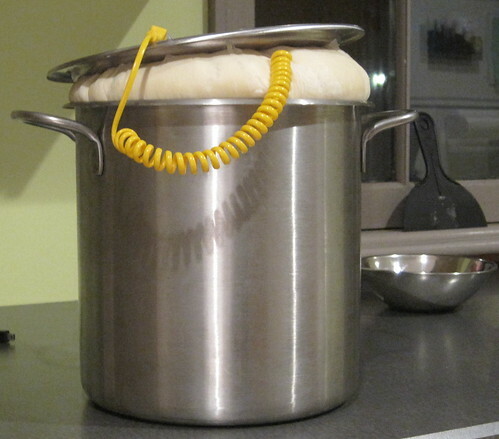 I punched down the dough (it rose even at those temps!) during the weekend about 2 times. Sunday night at 8 pm, I plunked a probe in the middle and took it inside to my chilly home to warm up until 4 am the next morning. It went from 38-50°F in 8 hours. The dough was punched down and scaled to 100 g and 200 g pieces. 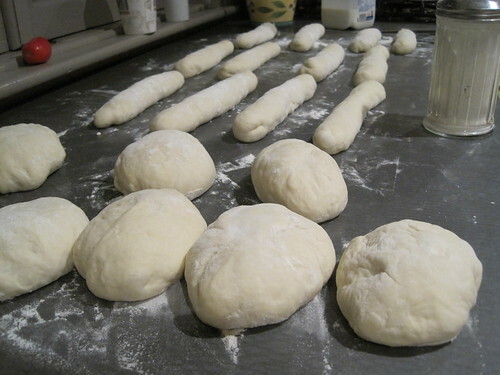 The 200 g pieces were formed into small baguettes and the 100 g pieces, boules and allowed to proof about 20 minutes each. 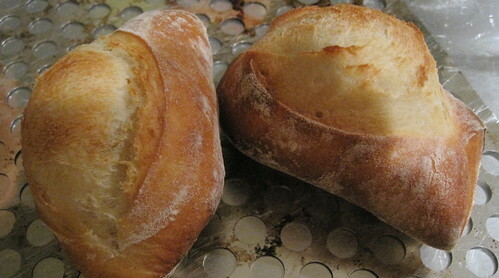 While 4-8 pieces proofed, another batch were formed into loaves. The house temp was cold and the proof was sluggish. Once the loaves formed I had between 20-30 minutes to get them in the oven. If any piece had overproofed, I punched it down again, reformed the loaf and let it proof again. Eventually I got a rhythm and the first batch of 4 small baguettes came out nice. The rest of the morning went well. I tried various shapes and docking methods to play around. After all was finished (2.5 hours), the loaves were placed in a basket with preserves, butter, napkins and left in the teacher's lounge. 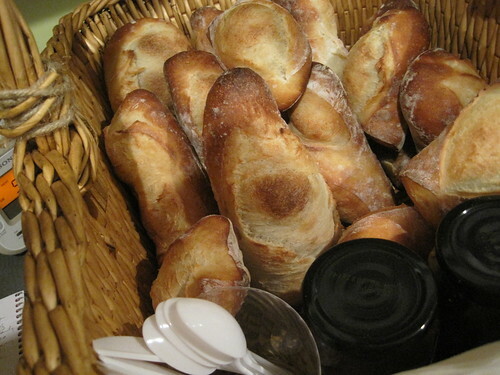 • At one point, I realized a 200 g piece was a bit much for a morning snack and took a long baguette-shaped piece of dough and chopped it into 80-100 g pieces with my spackle knife (pastry knife) and docked the center. It was a nice shape. Kind of a pillow with a vent on top. I never reformed the freshly cut ends - working too fast. 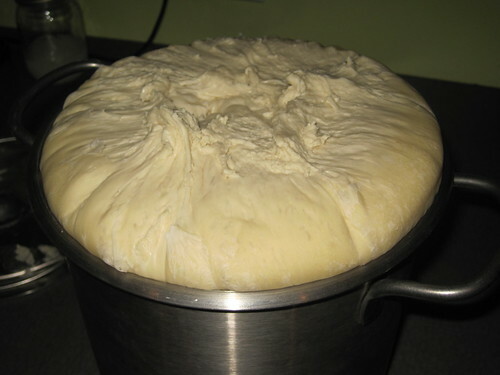 • Once the dough started to warm up by forming it into loaves, it started get pretty peppy rising. They all look terrific. I love their color and the way they burst through the slash across the tops. Lately I've been doing a quick version of baguettes (no retarding), but I'm going to have to give the long, slow method a try again. Thanks for the inspiration! Thanks for stopping by and the kind words Sherry. It was a blast. It's the only thing good about the cold weather. The cool temps in the house make everything kind of sluggish and gives one time to get into a rhythm. I still have information to append to the post. Just some bullets on what was good and to be changed for next run. The teachers were appreciative. Icing on the cake. Wow...compared to you, I feel inadequate kicking out one loaf. This production kills me even more! I love the shot of the pot with the probe in position. It all looks incredible. That is quite the talent. I bow before your greatness! Oh Wow, that bread looks so good!! The slow rise always is best. One comment that is totally useless, but, since you are using those frenchy metric measurements, should you not use celsius stuff? Mike, no biggie. Many loaves is (a little more) time consuming, but many economies of scale in most phases. Thanks. I'm still jealous of the Saveur nod. Nice job. Rosie You're insane. I hate the season, but I'll try to make some cookies for you. Or, maybe I'll pass 'em to Annie for her hungry times while at school. Chile. Most excellent observation. It's funny, but I hate Celsius. For weather, it's always 26, for cooking it's always 200. Celsius needs more degrees damnit.